پترسون (به انگلیسی: Paterson) مرکز شهرستان پاسایک در ایالت نیوجرسی آمریکاست. این شهر سومین شهر بزرگ ایالت نیوجرسی است. پترسون به دلیل نقش اساسی در تولید ابریشم در نیمه اول قرن نوزدهم به نام شهر ابریشمی معروف است. ↑ 2011 New Jersey Mayors Directory, New Jersey Department of Community Affairs, November 20, 2011. Accessed January 23, 2012. ↑ Gazetteer of New Jersey Places, اداره آمار آمریکا. Accessed January 24, 2012. ↑ U.S. Geological Survey Geographic Names Information System: City of Paterson, سامانه اطلاعات نام‌های جغرافیایی, accessed May 26, 2007. 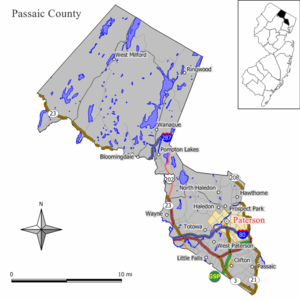 ↑ DP-1 - Profile of General Population and Housing Characteristics: 2010 for Paterson city, Passaic County, New Jersey, اداره آمار آمریکا. Accessed November 28, 2011. ↑ Table DP-1. Profile of General Demographic Characteristics: 2010 for Paterson city, New Jersey Department of Labor and Workforce Development. Accessed November 27, 2011. ↑ Look Up a ZIP Code, United States Postal Service. Accessed September 4, 2011. ↑ A Cure for the Common Codes: New Jersey, Missouri Census Data Center. Accessed July 14, 2008. مشارکت‌کنندگان ویکی‌پدیا. 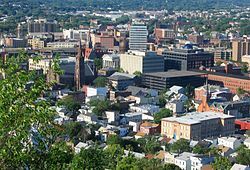 «Paterson, New Jersey». در دانشنامهٔ ویکی‌پدیای انگلیسی، بازبینی‌شده در ۲ فوریهٔ ۲۰۱۲.